The K2 Wolfpack is a well built reliable board but K2’s flatline isn’t for everyone. The Flatline tech aka Flat Camber is very stable and predictable. It’s great one footing, straightlining, making short radius turns and flatbasing. The drawbacks are the Wolfpack doesn’t carve well, isn’t very poppy and doesnt have the lively feel that many boards do. The Wolfpack isn’t compleetly dull but it is missing something that many of the hybrid shapes have these days. What is meant by hybrid is Flat/Rocker, hybrid camber, hybrid rocker. Also continuous rocker is more lively as well. Still this is one of the better flatline boards out there so if you are looking for Flatline The base is fast and the board is pretty stable at speed for a twin meant to be a freestyle board. So if you are looking for a fast freestyle twin with speed and easy turn initiation then this might be right for you. Some love flat camber or flatline tech and some hate it. We have had some bad experiences with the flat camber (flatline) and because of that are skeptical because of this but K2 made a good argument for flatline with the Wolfpack. The K2 Wolfpack is a fast, damp and aggressive board for those who like to straightline. 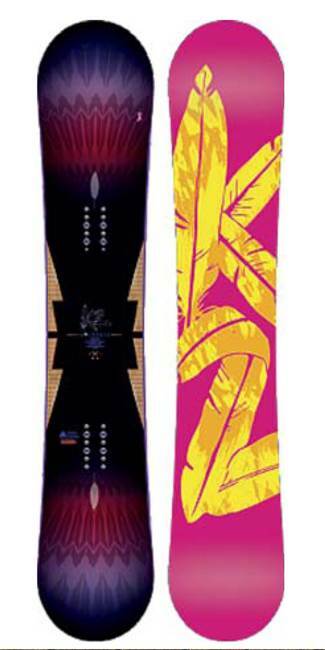 Groomers– This is a great groomer board. The Wolfpack is fast, damp and fun to ride on just about any condition groomers offer except for snowment and ice. If you like speed on morning groomers then you will love the Wolfpack. 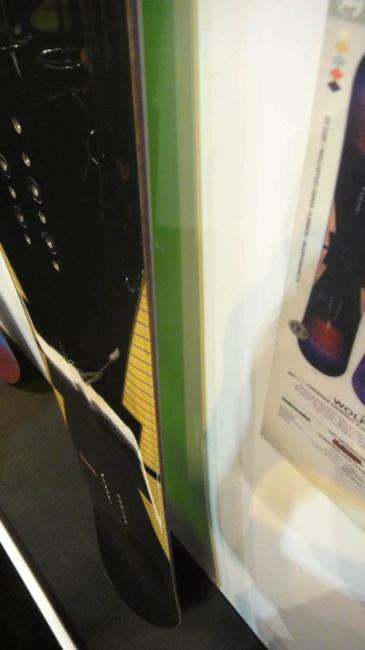 Powder: The Wolfpack will take more work in the powder than rocker and hybrid shapes but less than camber. It planes just as well as hybrid/rocker shapes but the work on the back leg is more like camber when you are at slower speeds or trying to keep the nose up. Turn Initiation/Carving- Even though this is a medium/stiff board the turn initiation is pretty easy. It takes more work than some but the rider looking for a board of this style will prefer this work. It’s kind of just dead when it comes to turning. There is no life or spring to the turns. The board does nothing for you and you do all the work. Even though it’s not hard it’s still lacking anything that’s dynamic edge to edge. We did find a bit of a weird thing going on when it came to carving out an aggressive turn. The board didn’t seem to respond like other hybrid shapes did. It seemed to miss the spring and linear turn that many boards we have tried. It felt like it skipped the last part of the aggressive carve that usually makes it really fun and just felt flat. There was also no real spring at the end of the turn which we normally really like. Weight- Not very heavy at all and one of the lighter mid to high level boards. The K2 Wolfpack seems to be a good balance of strength and weight. Edge Hold: The Wolfpack will hold an edge in just about anything you want to ride in but still is missing something when it comes to gripping really hard snow or icy conditions. Still it did a good job in the hard snow that had a little soft stuff here and there. It was a good day to test out edge hold. The Magnetraction boards will do far better than the Wolfpack but it still did a good job. Switch: This is a directional twin but there was a slight difference riding switch. Still it does a great job riding switch and it’s borderline excellent. Rails and Jibbing– Because the Wolfpack is very stiff it’s no fun even though it’s a flat camber. Not ideal for the jib park but you can hit a jib or two on the way to jumps or the half pipe. Pipe: The Wolfpack is slightly more forgiving than camber when it comes to pipe riding. Many prefer a softer board in the pipe but we found this to do a great job getting up and down a moderate sized pipe. The edge hold was enough to feel comfortable getting up and down a firm wall. Jumps: This isn’t the best for creating your own air on the mountain but pretty good for lapping the rollercoaster park. It was pretty good for flat camber but it’s still flat camber and not as springy as many boards we have tried. 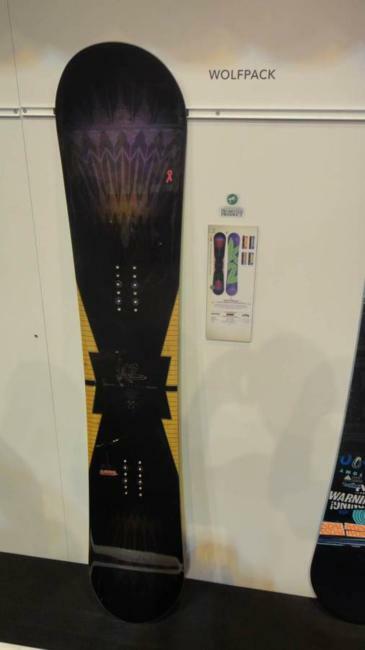 All in all the K2 Wolfpack would be a great board for someone who likes to speed around groomed runs and likes to make short/wide radius turns but not aggressively carve. It will be fun most places on the mountain the all mountain bomber will want to go. We try to get as many images of the K2 Wolfpack, but forgive us if they're not all there.